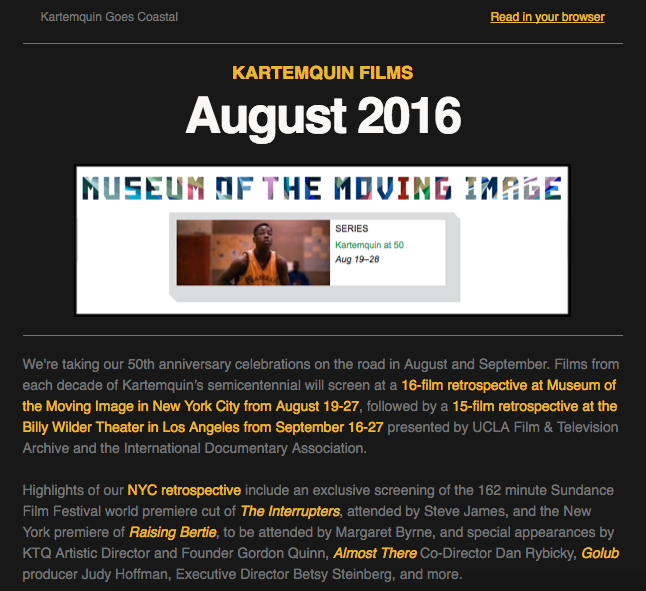 In August we brought KTQ to NYC with a 16-film retrospective at the Museum of the Moving Image August 19th through the 27th. It was our very first retrospective in New York City, and was hailed as a representation of the "highest form of non-fiction filmmaking" by Robert Levin at AM New York. Acclaimed director Steve James opened the retrospective by introducing an exclusive screening of the extended 2011 Sundance cut of The Interrupters, not screened since the film's 2011 world premiere. Kartemquin Artistic Director and Founder Gordon Quinn presented KTQ classics from its radical collective years, including Inquiring Nuns, Marco, Now We Live On Clifton, The Chicago Maternity Center Story and Trick Bag. The series closed out with the sold out NYC premiere of Raising Bertie, attended by director Margaret Byrne. We were nominated for three Emmys! Life Itself earned two Emmy nominations for Best Documentary and Outstanding Editing: Documentary and Long Form, and Homestretch earned a nomination for Outstanding Business and Economic Reporting: Long form. This marked the third year out of the past four that Kartemquin films have been Emmy-nominated, and the ninth and tenth Emmy-nominated films in our history. Back in Chicago, our exhibition Kartemquin at 50: Democracy through Documentary at Expo 72 finished its run on August 20th. What began as over 30,000 unsorted elements became a carefully curated and extensive visual exploration of both the evolution of the film collective and of documentary filmmaking itself--thanks to our staff and associates, who, in true collective-fashion, constructed the interactive exhibit and conducted engaging gallery talks with expertise and passion during the exhibit's three-month run.